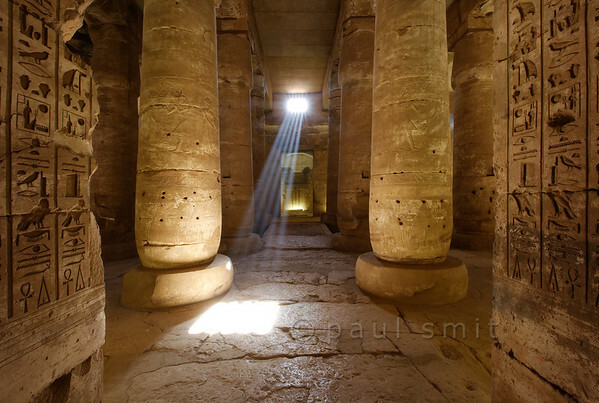 [EGYPT 29854] ’Second Hypostyle Hall of Seti I Temple at Abydos.’ Sun beams piercing through a clerestory window illuminate the Second Hypostyle Hall of the Seti I Temple at Abydos. Below the window we see the entrance to the Chapel of Isis. The hieroglyphs on the right and left adorn the gate which gives access from the First into the Second Hypostyle Hall. 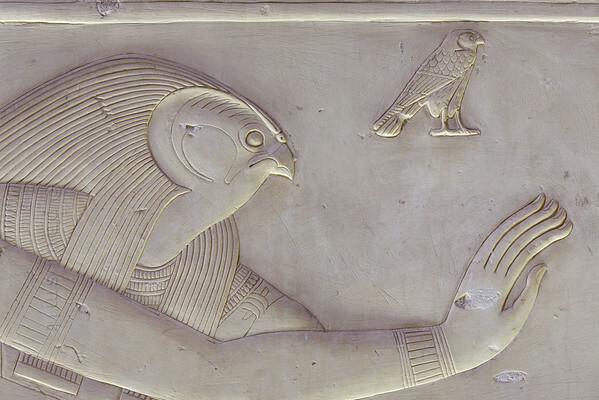 The Seti Temple at Abydos was begun by Seti I and completed by his son Ramses II in the 13th century BC. Photo Paul Smit. 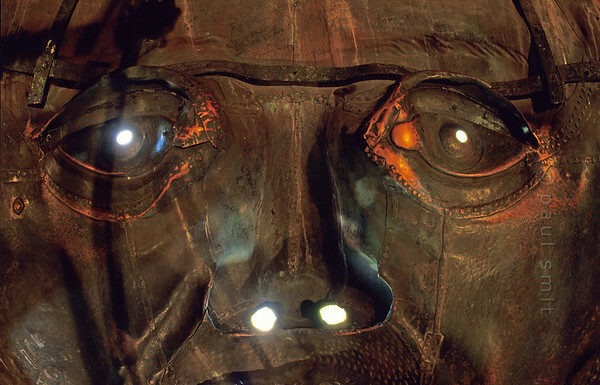 [ITALY.PIEMONTE 01747] 'Inside a holy head.' The Colosso di San Carlone, a huge copper statue dating 1698 of a canonized shoot of the mighty Borromeo-family, overlooks the slopes above Lago Maggiore near Arona. As an ordinary mortal you can see the world through his holy eyes by climbing a narrow stairway all the way up into his head. Photo Paul Smit. [FRANCE.ALPSNORTH 10986] 'Saint Anthony.’ Saint Anthony (the Great) is shown as a monk in the Espace Baroque museum in Lanslebourg. That's because he is often called the father of all monks, because he was the first Christian eremite to attempt living in the Egyptian desert and not on the city outskirts as some ascetics had done before him. This inspired others to a monastic way of life. The bell and the letter T ('tau") are his attributes. 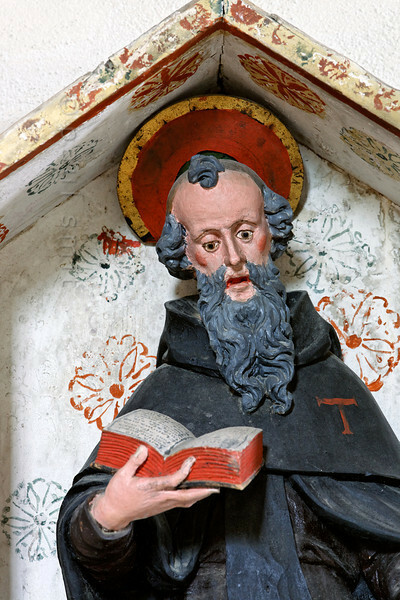 In the Alps Saint Anthony is the patron saint of domesticated animals. Since Savoy has always been famous for its cheese and since the Col de Mont Cenis was one of the most important routes to Italy in those days, cattle farmers and the donkey drivers recognized Anthony as their best friend. Therefore nearly every village in the Haute Maurienne has its own St. Anthony chapel. This statue, carved out of wood and painted, is made in 1629 by Jean Clappier. Photo Paul Smit. [AUSTRIA.VORARL 00909] 'Spirit of Ecstacy.' Better known as the Flying Lady, she is the car mascot on every Rolls Royce. 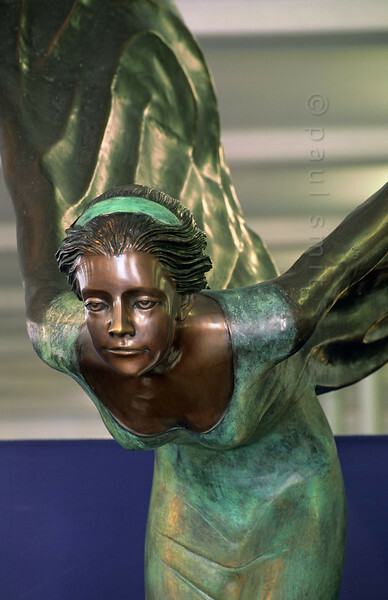 The Rolls Royce museum in Dornbirn possesses this life size beauty, also made by sculptor Charles Robinson Sykes. Eleanor Thornton posed for it, the secret lover and secretary of John Walter Edward Douglas-Scott-Montagu, a pioneer of the automobile movement and editor of The Car magazine from 1902. It was he who commissioned Sykes for the Rolls Royce mascot. Photo Paul Smit. 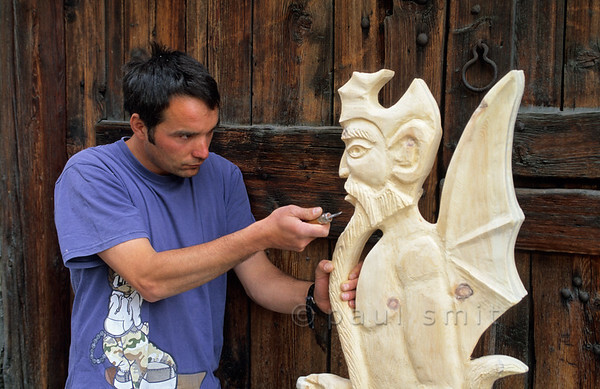 [FRANCE.ALPSNORTH 10979] 'Angel in flared pants.’ The Haute Maurienne is reknown for its art along the Chemins du Baroque, the Baroque Trail. Most of the angels seen in the local churches and chapels are putti, baby angels. But the Chapelle Saint Sébastien in Lanslevillard hosts two teenagers, of which this is one, in the role of a caryatid. He is wearing amazing flared pants and colourful toe-less boots. A real dandy! Photo Paul Smit. 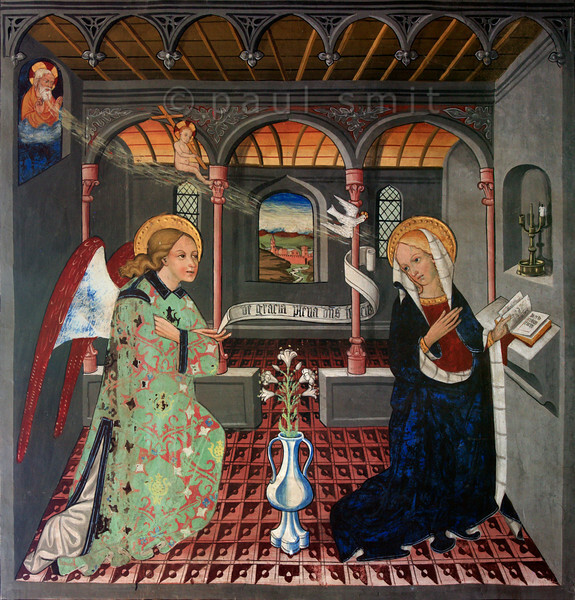 [FRANCE.ALPSNORTH 10970] 'Annunciation.’ Not only do the frescoes in the Chapelle Saint Sébastien in Lanslevillard reach an astonishing high artistic level, the colours have kept their original saturation as well. This most important work of art in the Haute Maurienne has been painted at the end of the 15th century by artists from Piemonte (now in Italy but then in the same country: Savoy). Its location may seem unexpected: a small village deep in the Alps. But the chapel is situated right at the start of the pass road over the Col du Mont Cenis, in those days one of the main connections between France and Italy. Touching detail in this fresco of the Annunciation: baby Jesus. He is flying, together with the Holy Spirit, from God to Mary. Photo Paul Smit. [FRANCE.ALPSNORTH 10984] 'Beautiful detention-work.’ The most important work of art in the Église Saint Michel in Lanslevilard is the Autel du Rosaire (rosary altar). It was made in 1627 by Jean Clappier, born in Vincendières near Bessans, while he stayed the winter in a chalet at 2300 m altitude ... as punishment for seducing a girl from Lanslevillard. I've rarely seen such a beautiful detention-work! 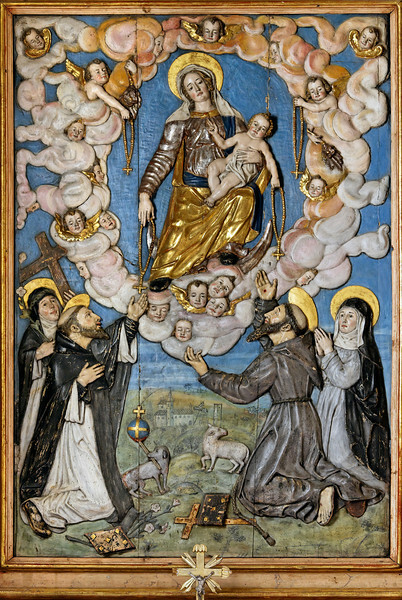 A bas-relief carved out of wood and painted shows a madonna with child, surrounded by a cloud full of putti, handing over rosaries to Saint Francis with Saint Clare of Assisi (at right) and Saint Dominic with Saint Catherine of Siena. Photo Paul Smit. [NEPAL.KATHMANDUVALLEY 27430] 'Matsya on Bhaktapur's Hanuman Ghat.' Upper part of a relief showing Matsya, located on Bhaktapur's Hanuman Ghat. Vishnu, in his incarnation of Matsya the Fish, rescued the sacred Vedas that had been stolen from Brahma and thrown in the ocean. During a deluge he also saved Manu, the Hindu equivalent of Noah, by towing his boat to a mountaintop. The sculpture has received offerings of flowers and red powder. Photo Paul Smit. [NEPAL.KATHMANDUVALLEY 27372] 'Saraswati, goddess of learning.' Relief of Saraswati, the Goddess of Learning, at a small temple near Lele, south of Patan. All those who worship her are believed to receive wisdom and learning. 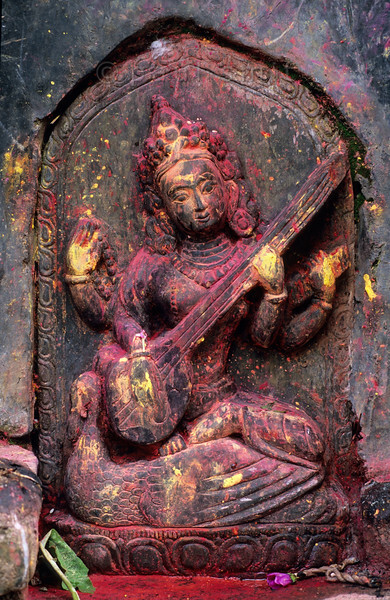 As goddess of music and poetry she is revered alike by Hindus and Buddhist. She is holding and playing Bina with her two hands and in her other left hand she holds a copy of the vedas. Her mount is a peacock. 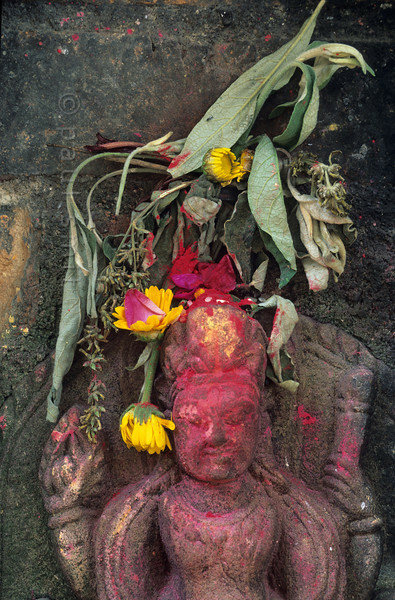 Yellow and red powder has been smeared on the sculpture during puja offerings. Photo Paul Smit. 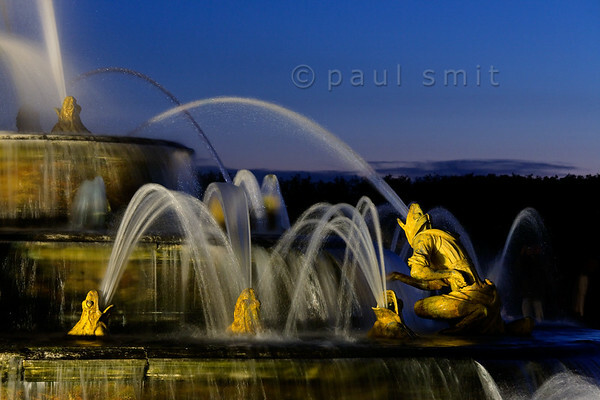 [FRANCE.ILEDEFRANCE 11096] 'Frogs at the Latona fountain, Palace Gardens, Versailles.' During the Fountains Night Show (Grands Eaux Nocturnes) every single fountain comes to life in a balanced lighting. Inspired by Ovid’s Metamorphoses, the Latona Fountain tells the story of Latona, mother of Apollo and Diana, protecting her children against the insults of the peasants of Lycia and calling on Jupiter to avenge them. He heard her plea and transformed them into frogs and lizards. The initial sculptures were made by Gaspard and Bathasar Marsy in 1670. The arrangement of the fountain was changed and finished by Jules Hardouin-Mansart in 1689. Photo Paul Smit. [EGYPT 29521] 'Outer hypostyle hall of Hathor Temple at Dendera.' The columns in the outer hypostyle hall (or pronaos) of the Hathor Temple at Dendera are crowned by four-sided capitals carved with the face of the cow-eared goddess. The faces symbolize the four cardinal points of the universe and stress the universal character of the sky goddess Hathor, who was also called "Lady with the four Faces". Here we are looking towards the eastern end of the hall. The ceiling has recently been cleaned of soot and dust and is decorated with a complex set of astronomical figures, constellations, planets and a zodiac. This part of the Dendera Temple was built during the Roman period (first century AD). Photo Paul Smit. 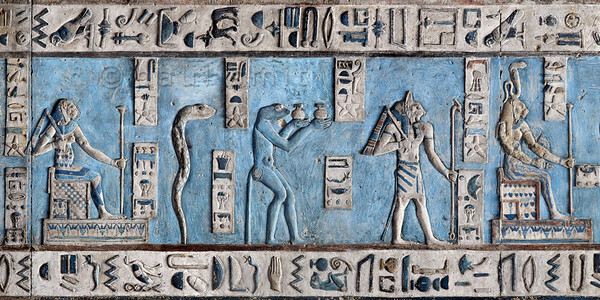 [EGYPT 29577] 'Lions, snakes and a cat on astronomical ceiling at Dendera.' Snakes and lions in all kind of forms populate the astronomical ceiling in the outer hypostyle hall of the Hathor Temple at Dendera. The ceiling consists of seven separate strips but here we are looking at a detail of the upper register of the SECOND STRIP WEST from centre. The figures in this picture represent decans. Decans were essentially 36 stars or star groups near the ecliptic whose rise or transit could be used to tell the time during the night. Eventually they were also used by astronomers as place-markers in the sky to divide up the Ecliptic in equal portions. Decans first appear during the Middle Kingdom on the inside of coffin lids, providing the deceased with his own private start clock. Unfortunately, during the subsequent centuries many different lists of decanal stars were developed and very few of these stars can be identified on a modern star map. The decans in this register were listed by Neugebauer and Parker as belonging to the Seti I B decan family. A peculiarity of these decans is that each is associated with a certain mineral, metal or type of wood. It is mentioned in a little caption near the lower part of each figure. Thus the lion-headed seated goddess on the left represents decan number 10 and is paired off with glass and gold. The erect snake next to her is decan no. 9 and is associated with iron and gold. The snake-headed baboon, no.8, is coupled with turquoise. The cat-headed god, no. 7a, is watching over copper and gold. And the lion-headed seated goddess, no. 7 is associated with gold. For other decanal stars in this register see picture 29572 and 29573. This part of the Dendera Temple was built during the Roman period (first century AD). Photo Paul Smit. [EGYPT 29960] ‘Horus in Ptah-Sokar Chapel at Abydos.’ In this relief detail a falcon-headed Horus is assisting at the resurrection of his father Osiris (who is outside the frame of the picture). The relief can be found on the south wall of the Ptah-Sokar Chapel in the Seti I Temple at Abydos. 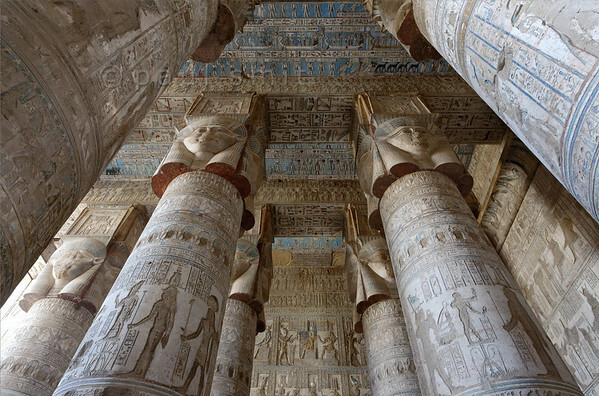 The temple was begun by Seti I and completed by his son Ramses II in the 13th century BC. Photo Paul Smit. 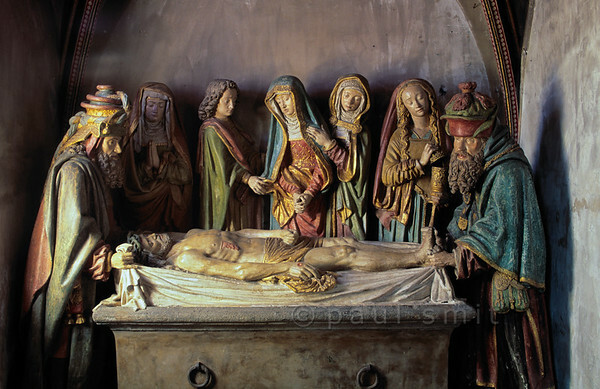 [FRANCE.AUVERGNE 28934] ’Entombment of Christ in Salers.’ The St. Matthieu church of Salers in the western Cantal has a splendid late medieval stone statue group depicting the interment of Christ. It is a work of the Burgundian school but also shows Flemish influences. In the centre Mary is consoled by St. John and the two extremities are occupied by the old men Nicodemus and Joseph of Arimathea. Mary Magdalene can be recognized by her free flowing hair. She is carrying a jar with aromatics for the anointing of the body. Photo Paul Smit.